Baseball Backstops | Discount Fence Supply, Inc.
Every softball or baseball field needs a quality baseball backstop to prevent the ball, the bat, or anything else from the game from flying back into the crowd and injuring somebody. At Discount Fence Supply we design and manufacture the best chain link baseball backstop available on the market today. 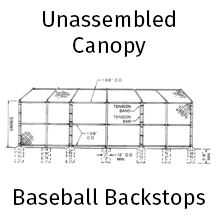 We offer both straight and canopy style baseball backstops. As you might imagine, a straight backstop is straight up and down, offering protection to those behind it, while a canopy backstop adds above protection by providing an overhang to the top of the backstop. 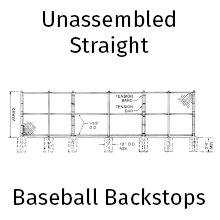 Our backstops are available either unassembled or in preassembled panels to makes installation easy. 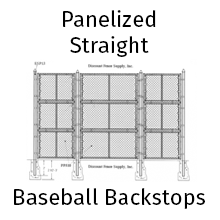 Simply choose the type of backstop you're interested in below to learn more. If you have any questions about our baseball & softball backstops, don't hesitate to contact our trained professionals toll free at (800) 878-7829 or over email at Sales@DiscountFence.com. We'd love the chance to earn your business.